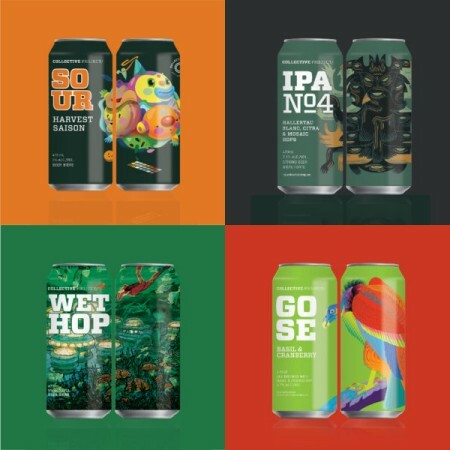 HAMILTON, ON – Collective Arts Brewing has announced details of four new seasonal beers that will be released starting mid-September through to early October. This brew starts as a classic Saison, utilizing a traditional Saison yeast to provide both spicy and earthy tones. We then inoculate the wort with Lactobacillus for 24 hours, giving the brew a refreshing sour flavour. From there we add locally grown and roasted pumpkins and traditional pumpkin pie spices. The final product is pure magic: sweet sour, and spicy. Refreshing and unique. It’s the season for fresh hops and as the 4th edition of our IPA project, our brewers knew they needed to find a mix that would deliver on an assaultingly juicy, dank aroma, and taste. We added hops everywhere but the boil in this hazy, yellow brew. Breathe it all in as floral, fruity, pineapple from the Hallertau Blanc, earthy, blueberry, blossoms from the Mosaic, and citrus, gooseberry, lychee from the Citra transport you to warmer longer days of summer past. This beer celebrates the harvest season with local Ontario hops picked within hours of brewing. 2-Row, wheat, and cara malts were mixed with a touch of Briess Wheat which lends this ale it’s goldish colour. The result is a straw-like, golden brew that’s extremely smooth and drinkable with a huge nose of juicy fruit and grassy mango, with pungent hops and a bready malt finish. We reward our adventurous kettle sour drinkers with this surprisingly satisfying combination. Expect a slight peppery, anise, savoury quality from the fresh ground basil with a refreshing, sharply dry fruity character of cranberry, rounded right out with the pink Himalayan salt and coriander from our core range gose we use as a base in this limited release. The four beers will be available in 473 ml cans, and will go on sale at the Collective Arts retail store at 11:00 AM on the dates noted above. Sour Harvest Saison and IPA #4 will also be getting LCBO distribution, and all four brands will be available at select bars and restaurants the week following their retail release.